Vapor blasting, also known as wet blasting or liquid honing, is a metal finishing process, just like polishing, anodizing, or plating. Developed during the Second World War in England, it was initially used in the aircraft and machine industry to create surface tension in parts in order to strengthen them. Rolls Royce used it to strengthen turbine blades before assembly into jet engines. From our restoration experience, this is absolutely the only way to properly prep engines, final drives and transmission cases for ground up restorations. Our process uses water, micro ceramic beads, oil/grease detergent, rust inhibitor, and high pressured air. All of these compounds are mixed into our slurry and propelled at high speed toward the casting surface or metal part we are reviving. The water element of the slurry provides a hydraulic cushioning effect to soften the micro bead's impact on the metal's surface. Working together, they provide a gentle, and somewhat time consuming process that peens the metal surface and leaves a bright lustrous satin finish. The peening process is what an old casting needs. It removes all of the grease and built up oxidation from the years and gives you a soft finish that seals the pores and eliminates unwanted oxidation or corrosion in the future. It's the proper way to preserve parts from the past and the only way to professionally restore a component or motorcycle. 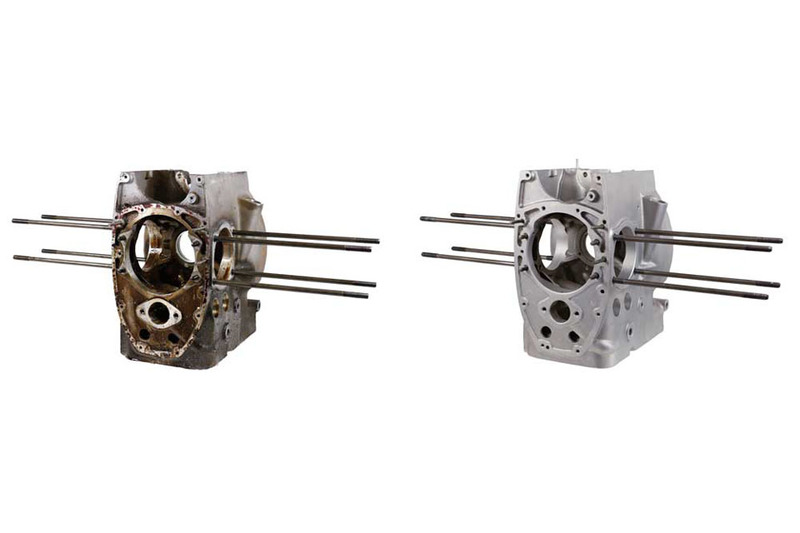 Finishes vary from alloy to alloy and manufacturer to manufacturer, but BMW casting always come out beautiful, as long as the parts we are prepping are serviceable. But be aware that vapor blasting will bring out any blemishes or scratches that hide under the built up grease and oxidation. The bottom line is that if you're in the process of a restoration or resto-mod, you have already spent many hours and a small fortune. This process is going to be a big part of the bikes appearance and should be the most important. The airhead engine is a piece of art! If you're as passionate about your Beemer as we are, let us help you restore it the way it should be done! We offer a fast turnaround as long as the form is filled out and submitted to us prior to shipping us your project. This will allow us enough time to put you on the schedule and be ready for your parts the day they show up. We can typically turn around a batch of parts in 48 hours from the time it is delivered. 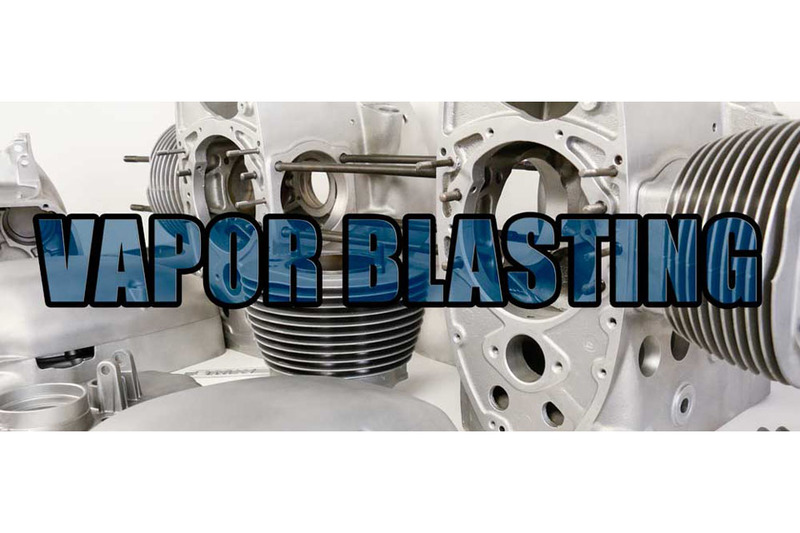 If you're ready for us to help revive your project, please fill out this vapor blasting order form and hit submit at the bottom. Once you have submitted the form, please print and include a copy of the form in the package you are sending us, so there is no confusion when the parts show up. Please remove as much oil and grease from the parts before you send them to us and please remove all gaskets and sealants so we can get right to work. There is an additional fee on all extra prep work that will need to be done prior to vapor blasting. If you ever have any questions about your project, please don't hesitate to contact us!